The 2012 NFL Draft was a success for the Miami Dolphins as the 'Fins found two starters in the first two rounds, including what they hope to be a franchise quarterback in Ryan Tannehill. This offseason, the Dolphins made significant upgrades with the addition of some key veterans. But for Miami to be a playoff team in 2013 they are going to need production from some of their younger guys, too, particularly on offense. This upcoming season should go a long way in telling how successful the draft of 2012 really was. Tannehill, who went 7-9 as a starter in his 2012 rookie season, will, without a doubt, start at quarterback. Tannehill will look to improve on a 12 touchdown, 13 interception campaign and will get the brunt of the attention from the sports media and the fans for how he performs, but this will be a big season for tackle Jonathan Martin as well. Drafted to play tackle opposite of Jake Long, Martin started all 16 games for Miami as a rookie in 2012. After Long's season-ending bicep injury late in the season, Martin took over at the left tackle position. Martin struggled early last season at right tackle and was less than stellar replacing Long. Martin will likely play the left tackle position for Miami this season and be tasked with protecting Tannehill's blind side. Martin, who was criticized for being small for a NFL tackle, has said to have put on some weight. With a schedule that includes premier pass-rushing defensive ends Greg Hardy, Michael Johnson, John Abraham and Mario Williams twice, Martin will need to be up to challenge. The success of the offense, however, is not dependent on just Martin and Tannehill making improvements, but little used players as rookies in 2012 are poised to take on bigger roles. 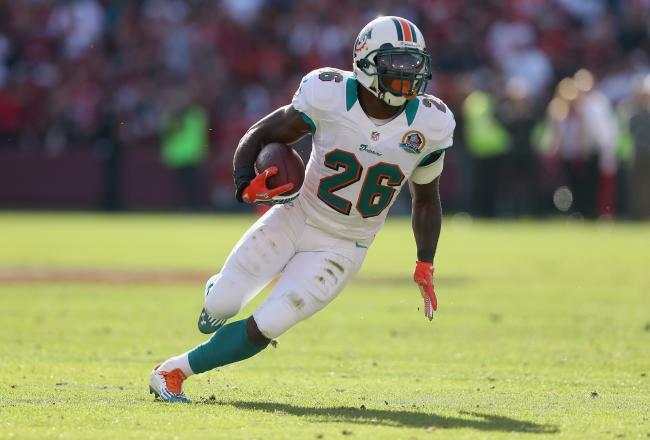 University of Miami product and second-year back Lamar Miller will split time with third-year man Daniel Thomas and could wind up being the feature back. Miller carried the ball just 51 times in 2012, a little more than three-per-contest. His 4.9 yards-per-carry average however, was better than either Thomas' or last year's leading rusher, Reggie Bush. Miller did move up to the number two back towards the end of last season, but with Bush now in Detroit, Miller will have to replace much of Bush's production. Similar to Bush in style, Miller could be a real contributor in the passing game as well as a guy who can give Miami big plays on the ground. While in college, Miller was even an excellent special teams player having returned kicks including one for a touchdown against Ohio State. While Bush was never an All-Pro, he had the best years of his career with Miami and averaged over 1,000 yards rushing in his two seasons with the Dolphins. Equaling Bush's production won't be that easy. Failing to make any sort of splash at all in 2012 was rookie tight end and third round pick Michael Egnew. An excellent pass-catcher at Missouri, Egnew did not record a single reception in 2012, but may be forced into action in 2013. After losing Anthony Fasano and his team-leading five touchdown catches to Kansas City, Miami is thin at tight end. Joe Philbin and Mike Sherman seem to like Charles Clay more in an h-back role as his production declined slightly in 2012. The Dolphins did acquire former New York Jets tight end Dustin Keller, but Keller battled injury last season and is coming off the worst year of his career. If Keller fails to stay healthy or produce as he did in 2010 and 2011, Egnew will have to step up. Defensively, Olivier Vernon will have the opportunity to take over the defensive end slot opposite Cameron Wake or at the very least, find plenty of playing time in a reserve role. Vernon proved to a valuable special teams player for the Dolphins in 2012 and even filled in some at outside linebacker. A physically gifted player, Vernon recorded 3.5 sacks as a rookie and is a better athlete than Jared Odrick, Miami's first round pick in 2010. Vernon will also battle rookie Dion Jordan, who was taken third overall by the Dolphins in this year's draft. Having already played a year in Kevin Coyle's system could prove to be advantageous for Vernon as well. But unlike the offensive side of the ball where Miami will need production from Martin, Miller and perhaps Egnew, a breakout season for Vernon would be more of a luxury, but it is entirely possible. While the Miami Dolphins are hopeful that key acquisitions like Mike Wallace and Philip Wheeler can help take them to the next level, increased production from a number of second-year guys will prove just as important this upcoming season.